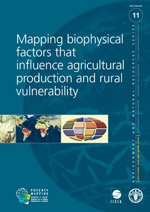 Ideas contained in this document are solely those of the authors and do not necessarily represent the views of FAO or IIASA. The conclusions given in this report are considered appropriate at the time of its preparation. They may be modified in the light of further knowledge gained at subsequent stages of the project. The designations employed and the presentation of material in this information product do not imply the expression of any opinion whatsoever on the part of the Food and Agriculture Organization of the United Nations or the International Institute of Applied Systems Analysis concerning the legal or development status of any country, territory, city or area or of its authorities, or concerning the delimitation of its frontiers or boundaries.